What she said surprised him, said White. “She told me that there is an elevated form of the Hul’qumi’num language that is only used in very close and intimate relationships between two people who really know each other and really love each other,” he explained. White said that special form of Hul’qumi’num described by his grandmother used different grammar, diction, tones and rhythms. It was used only in very personal contexts and not for day-to-day relations and conversations. “To me it sounded like she was describing a poetic way of talking to each other, in a place of unquestioned safety and love,” White said. So opened the wide-reaching keynote speech by White entitled “Re-Imagining Reconciliation: Confronting Myths and the Future of Canada” at Vancouver Island University on November 26. Offered in partnership with the CBC Radio One’s show Ideas, the talk marked the fourth instalment of the series, and the last before long-running host Paul Kennedy retires. Currently a Snuneymuxw First Nation councillor and director of VIU’s Centre for Pre-Confederation Treaties and Reconciliation, White used his vast knowledge base in this and other capacities — including as former Chief of Snuneymuxw, member of the First Nations Summit task group, member of the BC First Nations Leadership Council, and lawyer and negotiator for First Nations governments across the country — to paint a clear picture of what reconciliation currently is in Canada and where he believes it needs to go. Presently, how reconciliation is conducted rests on a series of myths, White explained. The first myth is foundational, a myth of omission in how reconciliation is discussed. We’ve become good at talking about reconciliation in its legal, political, economic, social and cultural dimensions, he said, but we fail when it comes to positioning those talks on a foundation of love, intrinsic values and our potential as human beings. To exemplify this point, White referenced the sentiment present during a 1910 visit to Kamloops by then-prime minister Sir Wilfred Laurier. At this time, Laurier was formally addressed by a delegation of various B.C. chiefs which culminated in an extraordinary document known as the Laurier Memorial. The second myth identified and addressed by White was rooted in the perception that courts and lawyers were necessary in leading the work of reconciliation. 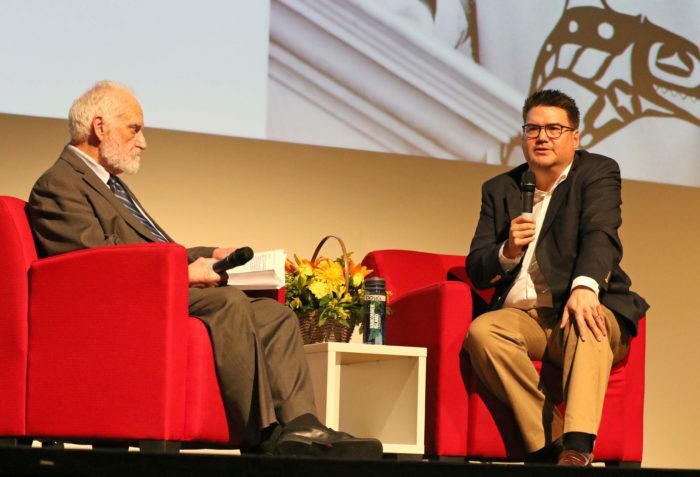 “Lawyers and courts serve a purpose, but they are a blunt tool in reconciliation work,” said White, who pointed to a variety of causes, including political failures and lack of political will. The final myth confronted in White’s keynote speech was the idea that “we are well on our way” in the process of reconciliation, when really the path was only just beginning. Referencing the 2014 Supreme Court of Canada decision regarding the Tsilhqot’in First Nation, which for the first time recognized expansive Aboriginal title, White said this came with sweeping implications and points the process of reconciliation down a fundamentally different path. “[It] stands as a major counterpoint to all the law, policy, regulations and patterns of behaviour that are premised on the idea that Aboriginal title doesn’t matter,” said White. As a result, he argued that much of the economies in this country are structured on wrong ideas, and now need to be rebuilt around the reality of Indigenous peoples’ relationship to their lands and decision-making about their territories. To do this, ingrained patterns that were currently taken for granted about how things have always been done would need to change. Julie Chadwick is an award-winning journalist, editor and author living in Snuneymuxw territory.